Much is being made at the moment of the idea that banks should have more capital. Predictably, there is huge confusion about what this actually means, and the usual suspects are once again mixing up deposits and capital (deposits are debt) and claiming that QE recapitalises banks (no it doesn't, but it does provide them with liquidity). I don't want to explain the difference again here, but if anyone is still unclear about what "capital" consists of for a bank, read this. Predictably, banks and other financial institutions are fighting back. Concerns are being expressed about the effect on competition of EU's proposal for money market funds (MMFs) to have capital and liquidity reserves. And banks worried about their return on equity (already shot to pieces) claim that raising more capital would be a) unacceptable to their shareholders b) hugely expensive c) impossible anyway. Meanwhile, Anat Admati and Martin Hellwig, in their book "The Bankers' New Clothes", claim that the banks' arguments are specious: banks in the past have been much more highly capitalised, the Modigliani-Miller model shows that (apart from tax considerations) equity is no more expensive than debt, capital can always be raised if the price is right. This is yet another argument that could run for years and become increasingly political. Personally, I'm not going to take sides. I think they're all missing the point. You see, there is actually no significant difference between debt and equity. Both are claims on the bank's income (when it is a going concern) or its assets (when it is bust). Nor is debt in any way money that the bank is "looking after": as far as the bank is concerned, debt is funding for things it wants to do (lending, trading...). And debt includes customer deposits. Customers believe that when they put money in a bank deposit or current (checking) accounts they are putting it in a safe place. But that's not true. Customers are actually lending that money to the bank, which can use that money in whatever way it wishes. And as Andrew Lilico points out, they have no automatic right to return of that money. All they have is a claim. In the event of insolvency, that claim will only be honoured if there are sufficient assets to meet it after settling more senior claims. When a bank fails, the only real difference between a depositor, a bondholder and a shareholder is the seniority of their claims. You can see that, for a bank that meets current UK regulatory requirements for a leverage ratio of 3%, this wipes out the bank's shareholders. They lose their entire investment. Junior bondholders (holders of various forms of subordinated debt, including the so-called "Co-Cos" about which there has been much discussion) are bailed in and wiped. Their bonds are converted to equity and they no longer receive interest payments. They become ordinary shareholders, waiting patiently for the bank to be restored to health so their shares can recover their lost value and they can start to receive dividends again. However, sometimes governments interfere with this. When the Dutch bank SNS Reaal was nationalised recently, junior bondholders were wiped along with ordinary shareholders. Shares and subordinated debt were cancelled completely via an expropriation order by the Dutch government. In effect, the Government took over the claims of shareholders and junior bondholders against the rescued bank. There was a fair degree of outrage among investors about this, but it is worth bearing in mind that had the bank been allowed to fail, shareholders and junior bondholders would have lost their entire investment anyway. The Dutch government chose to rescue depositors and protect the financial system. They were under no obligation to make good shareholders and subordinated debt holders. Depositors, senior bondholders and wholesale lenders are currently ranked equally ("pari passu") in their claim for settlement. However, debt that is secured directly on assets effectively ranks senior to unsecured debt, because it has a prior claim on certain assets. 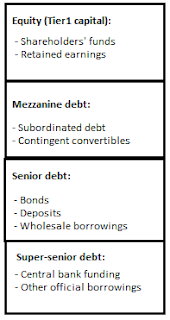 So if the bank has issued asset-backed securities, or borrowed money via the repo market using its assets as collateral, those creditors effectively rank senior to depositors: the assets backing their debt are not available to settle other claims (they are "encumbered"). If those assets turn out to be worthless, the debt is effectively unsecured and its holders have an equal claim to a share of unencumbered assets. The UK's Independent Commission on Banking recommended that depositors should rank senior to bondholders ("depositor preference"), and the EU is considering legislation to enforce this from 2018. But currently, once junior bondholders have been bailed in, both unsecured senior bond holders and depositors are fair game. This means ALL depositors - not just large ones. There is no intrinsic difference in claim seniority between large and small depositors. Once depositor preference is established, though, senior bondholders would take losses before depositors. The most senior of all claims are the official sector - central bank funding and other public sector loans. Only if a bank was so deeply in trouble that all deposits were wiped would the official sector take losses. I suspect that government would step in long before that point was reached. The Brown-Vitter proposed legislation in the US would force banks to increase their Tier1 capital ratio (unweighted) to 15%. Anat Admati wants it to be 25%. That would mean that bank asset writedowns would have to be far greater before depositors were at risk. But it wouldn't eliminate the risk completely. And it would place other people - or potentially the same people, in a different way - at risk. Capital is not simply "money that absorbs losses". It is people's savings. The principal shareholders in banks are pension funds - which invest the money that people save for their retirements. Losses for these people are just as serious as losses for depositors: although the consequences may not be felt immediately, money lost through investment failure may mean a materially lower standard of living in retirement, as Equitable Life pensioners could tell you. If we force banks - and potentially corporations too, since highly-geared corporations are a risk to their stakeholders - to finance themselves much more with equity than debt, losses will still fall on ordinary people. It's the same money, just in a different form. We should not forget this. 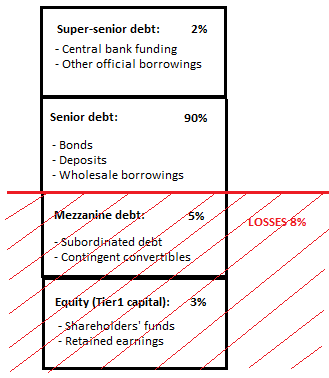 My walk through capital structure above I hope showed that when a company is failing, it does not matter whether you call your investment equity or debt - what matters is the seniority of your claim. Losses are the same whether it has 15% equity or 3% equity. Increasing the proportion of equity does not make it less likely to fail. All it does is increase the likelihood that creditors will get their money back. The distinction between debt and equity made by, among others, Anat Admati is misleading. In insolvency, debt and equity are fungible. It does not matter whether the debt is called "subordinated", or secured on assets: if losses due to asset writedowns are sufficiently large and widespread, all debt is effectively converted to equity. Creditors have no more intrinsic right to return of their money than shareholders. They get paid first, but they don't necessarily get paid completely. Nor should they be. Lending money to anyone is risky. Banks are no exception. As long as it is clearly understood that creditors can, and should, lose money in insolvency, there is no reason for vast increases in equity in bank capital structures, because debt is effectively equity anyway. I know that everyone is now going to shout - "BUT WHAT ABOUT DEPOSIT INSURANCE"? The reason for protecting small depositors with deposit insurance is a social one. It has nothing to do with preventing bank runs, really - the best way of preventing a bank run is to ensure people know that banks can't run out of money (liquidity), which means a central bank doing a good job as Lender of Last Resort. Bank depositors are assumed to be naive people who don't understand finance, so need protection from risky banks. I don't think this is acceptable, really. These people are only too happy to put their money in banks when they could put it elsewhere. It needs to be made clear to them that their money is no safer in a bank than it would be in an investment fund - and then let them make an INFORMED choice about what to do with their money. There are advantages to bank deposits even if they aren't fully safe. There is in my view a case for protecting transaction accounts from losses, because we have become so dependent on banks for payments that allowing current accounts to take losses would cause real hardship to many people. But these are political considerations, and I am only expressing a personal view. They have nothing to do with the nature of deposits. All bank deposits are investments. "The value of investments can fall as well as rise, and the return of the investment is not guaranteed." Why isn't this statement on every bank deposit account agreement? I am certainly not suggesting that banks increasing the proportion of equity in their capital structure is a bad thing. On the contrary, there is plenty of evidence that heavy reliance on debt finance can be destabilising not just for banks but for corporations, too, because of the cost of debt service and the risk that creditors will foreclose. Personally I would eliminate the preferential tax treatment of debt, which encourages debt financing at the expense of equity. But we should not buy into the idea that increasing the proportion of equity in the capital structure makes banks "safer". It doesn't. The only thing that really makes banks safer is limiting the risks they can take and ensuring they are well managed. When, please, are we going to regulate lending properly? * Yes, you are right, this does look very much like a CDO tranche structure. That's because it is. A CDO is a financial company and its tranche structure is a corporate capital structure. The cost of bankruptcy is not zero, it is very expensive and impairs the realizable value of the underlying assets and usually imposes some form of liquidation/firesale. Whereas for equity to lose half its value is automatic, for debt the process involves an army of lawyers, accountants and counterparties taking their pound of flesh. Unwinding portfolios of assets heightens systematic risk. It would help if clarify what you mean by failure, because common usage of that word when applied to institutions is default. The fact that bottom feeders clean up when a company defaults on its debt doesn't invalidate my argument. 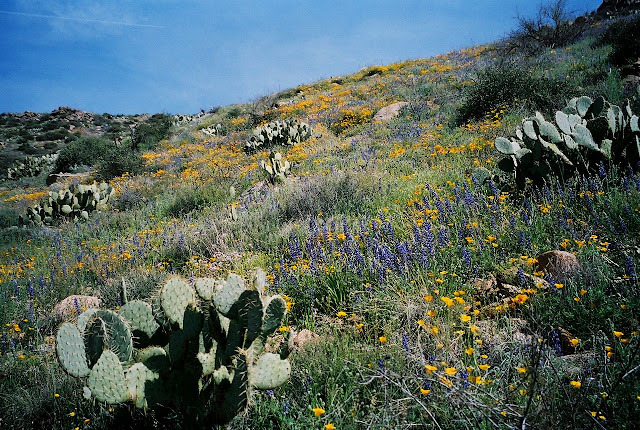 Creditors are subject to losses just as shareholders are. They have a senior claim on assets, that is all. But that isn't all, either from the perspective of investors or companies. If I can't make a debt repayment as a company, the business gets liquidated, and there is a large cost to that. If I can't pay a dividend the dividend gets cut and the business continues as per normal. From an investors perspective there is a huge difference as well. The economic effect of creditor loss is much more 'shocking' than a loss in equity, rightly or wrongly investors are a lot more scared when they lose money in things they believe to be safe than things they believe to be risky. Bailing institutions out reinforces this perception. By all means make the argument that creditors should expect and be capable of dealing with losses, but saying debt and equity are equivalent is just not true. Actually, if you can't make a debt repayment your creditor has a claim on your assets, which may or may not require liquidation in order to realise. Your shareholders have no "right" to income (dividend), but they also have a claim on your company's assets - since they own them. Therefore arguably the situation is the same, really. Or you can regard creditors as having a claim on shareholders. Investor perception is flawed and dangerous. The belief that investments are "safe" is one of the biggest causes of bubbles and busts. And bailing institutions out to protect creditors has done immense damage. We have to end this madness. I am not arguing that debt and equity are GENERALLY equivalent. I am saying that in insolvency the outcome for creditors is the same as for shareholders - the only difference being the extent of recovery arising from claim seniority - and that therefore in the particular case of insolvency, debt and equity are equivalent. whilst I agree with your points in bankruptcy, regulators have - in my view rightly - moved on to favour going concern capital over gone concern capital, one reason being that during the crisis gone concern instruments (=Tier 2) were widely ignored, and even non-equity going concern instruments (=Tier 1) were heavily discounted. As we have discussed on Twitter, you could of course make the instruments bail-in-able (someone needs to find a better word for that) but in order to match the properties of equity you'd really need to make coupons optional, non-cumulative, and allow for unlimited extension, all of which should not trigger cross default on any other liabilities of course. This means your senior debt becomes a hybrid Tier 1 instrument, and as such will be significantly more expensive. 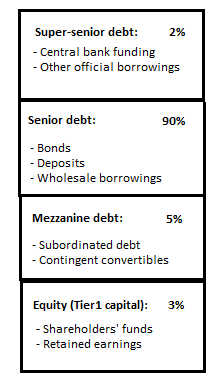 I think the Cyprus precedent establishes that senior debt, including deposits, is de facto convertible to equity. 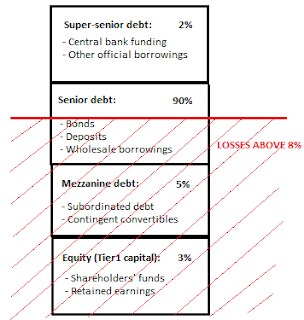 In effect the only form of debt in Eurozone banks now is subordinated. I expect funding costs for banks to rise considerably in the Eurozone periphery. I agree there are differences between equity and debt with regard to the certainty of income. However, as the whole point of capital requirements is to protect creditors from losses when a bank fails, I was considering the special case of insolvency, not debt & equity equivalence "in general". In insolvency creditors' income claims are wiped even if principal is repaid. In conclusion: creditors should expect to take losses, so whether a bank is funded with debt or equity is not as important as is being made out. What is far more important is regulation and management of the asset side so banks don't fail in the first place. If your debt is convertible and you have a reliable lender of last resort you don't need massive amounts of equity. Equity does not protect against failure and it may encourage excessive risk-taking in the belief that it will absorb losses (yes, that would be a failure of fiduciary duty, but we are talking bad management here). I am with blackraven, the way deposits and equity is perceived is the difference. People realize they might loose equity but small business owners don't consider their bank accounts to be investments. Expectations also means that higher capital ratios reduces the risk that the government feels the need to bail out banks since there will be less unexpected losses. If you agree with Admati's use of Modigliani and Miller, then unexpected losses would be the same, system-wide, but distributed differently. Brown-Vitter is a reasonable policy for a time when a run on the bank literally referred to a sudden withdrawal of deposits. But a modern systematic crisis will probably involve interbank financing, shadow financing, collateral demands, and counterparty risk reassessment. Assets to equity is no longer a robust measure of risk. Basel III has major problems in execution, but Brown-Vitter seems to be taking the easy, and wrong, way out by confusing simplicity with strength. 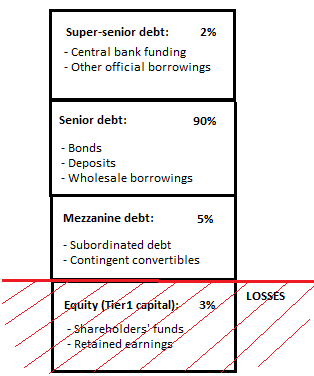 At least BIII liquidity in stress scenarios and counterparty risk. Excellent post Frances. Makes the whole issue nice and clear and allows us to have a debate about the various options. So if I may I'd like to put my view. "Why isn't this statement on every bank deposit account agreement?" Because most people see bank deposit accounts as a safe storage medium. You don't want too much in your transaction account in case of fraud on it. That is the reality of the situation, and the system has to reflects the expectation of people's feelings. Money in a bank is seen as safe. Therefore it has to be safe or you get an expectations mismatch and a sudden shift in behaviour when the bank illusion is shattered by events. The correct design is for the transaction and deposit system to be entirely backed by the state - whether that is fully insured, in trust or in specie is another debate. There should be no such thing as 'at-risk' retail and wholesale deposits on the balance sheet of commercial banks. There should be capital bonds, equity and - for those banks prepared to accept the necessary restrictions on lending - central bank funding. Modigliani & Miller's model does not show that equity is no more expensive than debt. It shows that the weighted average cost of capital is unaffected by various combinations of equity and debt (assuming no tax subsidies on debt). 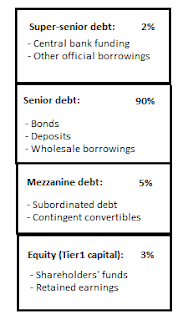 But as an individual component, M&M assume equity is more expensive than debt. Yes, you are right. Equity itself is more expensive because of the risk premium - which shows itself as reduced seniority. I agree I was unclear in my wording. What is the point of imposing the cost of learning all the different dangers of different forms of holding money on small savers and small depositors? Is there nothing that people don't have to worry about in your theoretical world? No safe place for anyone? Imagine an entire life spent on learning about banks, cell phones, mortgages, medicines, doctors, employers and every other consumer need or desire. The stupidity of that kind of life boggles the imagination. Although in legal terms depositors are creditors, there are at least two significant conceptual differences between them and a bank's bond holders. 1. Depositors are customers of a bank who are led to believe the banks deliver a vaulting service for their cash. Bondholders are not customers - they do not contract to receive a service in exchange for their investment. Bondholders receive interest in return for investing. Depositors may or may not receive interest. They may even be be required to pay bank charges for "investing" with a bank. 2. Depositors are virtually compelled to "invest" with a bank. Pensions, benefits, wages, salaries, etc are now almost entirely paid into bank accounts. Most people have no choice over the matter. An employee cannot demand their employer pays them in cash. In contrast, bondholders choose to invest in a bank in preference to buying government bonds or other corporate bonds. Consequences are just deserts when they arise from choice but not in cases where there is no choice. I believe it is logically incorrect to conflate depositors with other bank creditors. I also believe the distinction between equity holders and bond holders is significant and real. Equity holders will have a vote at a bank's AGM, whereas the bondholders in normal circumstances won't, to highlight just one difference. 1. No-one is "leading customers to believe" that their cash is put in a vault. Customers choose to believe that, but no such commitment is ever made by banks. I might criticise banks for not making it clear that deposits are placed at risk. But I can equally criticise naive customers who believe things they are never told. The charges on some current accounts are for transaction services, not for safe custody. I'm not aware there are ANY non-transaction accounts that currently bear negative interest rates (or fees in excess of interest paid, which is the same thing). 2. I noted in the post that since transaction accounts are virtually essential now, there is a strong case for protecting them from loss. But they are still technically "investments" and exposed to losses in excess of deposit insurance limits. 3. In terms of the special case of insolvency - which is what I am discussing in this post - there is no difference in seniority between depositors and other creditors. You may wish there were, but that is not currently the case. Regarding equity holders - yes, they have votes at the AGM. When a bank is failing, that counts for precisely nothing at all. If the banks do not offer a vaulting service for people's cash, then why on earth should people bother with a bank account? Do you recommend they keep their cash under a mattress or carry their cash on their person? Are you saying that depositors are solely creditors / financiers and that no customer relationship between them and the banks exists? Banks charges often include a monthly fee and not just charges per transaction. The point I made was not that bank accounts are nowadays essential. My point was that they are nowadays effectively compulsory. Do you believe that citizens should effectively be compelled to put their money at risk of confiscation? Do you believe that such compulsion is compatible with a free society? Equity holders have a right to vote at a solvent bank's AGM every year. If the equity holders have appointed, or have failed to remove, a bad management then it is they, the equity holders, who should bear the consequences when a bank fails, not innocent depositors. Equity holders are owners. Bondholders and (in a technical legal sense) depositors are creditors. Depositors are also customers. It is simply wrong in my view to lump the three stakeholder groups together. They have different legal rights, responsibilities, and expectations. Banks do not, and never have, offered a vaulting service for people's cash in the form of bank deposits. Bank deposit accounts are investments and the cash is placed at risk with no guarantee of return. I'm sorry if you don't like that, but that is the legal position. Monthly fees on accounts are service charges, not safe custody charges. I really suggest you read the small print. What I personally believe is not the point, although I did state my personal views on the safety of transaction accounts in the post. The present situation is that all deposit and transaction accounts are protected by deposit insurance up to (in the UK) a limit of £85,000 per person per institution (i.e. across all accounts belonging to the same customer in any one bank). Above that limit there is no protection, the money is at risk and you have no guarantee of return. If you don't like that, campaign to enforce a change to the legal definition of bank deposits. Simply saying "it shouldn't be like this" doesn't change the law. In the special case of insolvency, which is what I was discussing, the different legal situation of shareholders and creditors becomes irrelevant. All that matters is the seniority of claims. If unencumbered assets are insufficient to make good uninsured depositors, they will lose their money. I'm afraid that currently is the legal position. Regarding insured depositors, if there is sufficient money available in the deposit insurance scheme they will be reimbursed for losses. However, the legal position regarding the EU deposit guarantee scheme (of which the UK is part) seems to be that sovereigns are not bound to make good insured depositors if insurance funding is insufficient. In practice the UK sovereign probably would top up the insurance fund to ensure that deposit insurance could be honoured (as it did following the failure of Bradford & Bingley in 2008), but states that don't have a central bank and can't borrow may be unable to do this. In the end, deposit insurance is only as good as the ability and willingness of the sovereign to honour it. A vault is a facility where people can place items for safe keeping. Banks perform a vaulting function because it relieves depositors from storing large sums of cash about their person or under their mattress. The fact that money increasingly is becoming electronic does not take away the vaulting function that banks fulfill. Electronic money means that depositors no longer need to carry sums of cash on their person. The service charge of which you speak is for the service rendered - vaulting, including the record keeping and providing customer statements. Most ordinary depositors do not place their money in a bank following an investment decision. They deposit because a) it is virtually compulsory, and b) to keep their money safe from fire, flood and theft (ie in a safe place, or a vault) In any case, describing depositors as investors confuses the distinction between saving and investing (or savers and investors). You make a very good case for separating retail banking from merchant / investment banking. If the current legal framework groups ordinary bank depositors with bondholders (who are long term professional financiers) so that both groups bear similar risks then perhaps new institution need to be created which are more suited to the needs of ordinary depositors. The deposit insurance scheme is a hurriedly applied sticking plaster over this anomaly which at least acknowledges the absurdity and dysfunctionality of the current legal framework. Applying the dictum of "caveat emptor" to unsophisticated depositors smacks of sharp practice and is, I suspect, a manifestation of the same banking culture that caused the recent financial collapse. In short, dishonesty. New institutions could be created, were the legal framework and Treasury rules to change, that enabled depositors' money to be lodged with 100% safety (that is, with no risk of confiscation caused by bad management, inactive shareholders , or the apparent dishonesty of bankers). Such institutions could be forbidden from lending - they would merely fulfill the vaulting function that most people believe is the proper function of a bank. None of this is rocket science - every town and village could set up its own vault as a social enterprise, linked over the internet to facilitate electronic payments. All that is needed is a PC, internet connection, appropriate software, and some labour. Depositors needing to borrow money would need to apply to other authorised lending institutions. Increasing equity capital is a way of protecting a bank's long term creditors. It is the shareholders who should lose their money in the event of a bank going under. If a bank's capital structure contains sufficient equity then the bondholders and other creditors should be able to recover the amounts they have loaned from the sale proceeds of a bank's assets. That owners should be the prime bearers of risk is a principle of capitalism, a principle that bankers frequently pay lip service to but seldom support in practice. Asserting that equity and debt capital are essentially the same is misleading and serves to help shareholders escape the consequences of their own negligence or incompetence. I'm afraid you are simply wrong. Bank deposits are not, and never have been, a vaulting service. The service charge is not for vaulting but for payment services. Bank deposit accounts are investment accounts. Your money is lent to the bank which uses it to fund risky activities in order to generate a return, part of which may come back to you in the form of interest. I do not make any case for separating retail and merchant banking. Retail deposits are used to fund risky retail lending. Far more money is lost on mortgage defaults than failed investment banking. Of the last 4 banking crises in the UK, 3 were caused by property market crashes bringing down over-leveraged mortgage lenders. The idea that retail lending is "safe" is completely mistaken. It is nothing of the kind. By all means make the case for there to be savings banks. We do have one - the National Savings Bank. But our banks are not, and never have been, savings banks. They are commercial lending banks. If you put your money in a deposit with a commercial bank, you are placing your money at risk. Same with building societies. You have completely misunderstood the point I was making about the equivalence of debt and equity. In death (insolvency) - which is what I was discussing - the only difference between debt and equity is the seniority of the claim. Yes, shareholders get wiped first, but creditors also take losses. The mistaken idea that creditors should not ever have to take losses has done an immense amount of damage to the fabric of society. This madness must end. Creditors who lend stupidly should bear the consequences, not be bailed out. If someone entrusts their money to another party, be the money electronic or physical, then a vaulting service is being supplied. I can't see the difficulty in acknowledging or understanding this point. You say banks have never provided a vaulting service for physical money. The history and origins of banking tells us otherwise. Gold and other precious metals were lodged with goldsmiths, the direct forerunners of banks, by merchants for safekeeping. Bank accounts for most depositors are not "investment" accounts. Most people's bank deposits hold transaction balances. I think it might be helpful if you distinguished between sight and time deposits and then between depositors and professional bond investors. I notice you do not address the points I made that distinguish the owners (equity holders) of a bank from its creditors. I have not misunderstood your point about the equivalence of debt and equity at all. 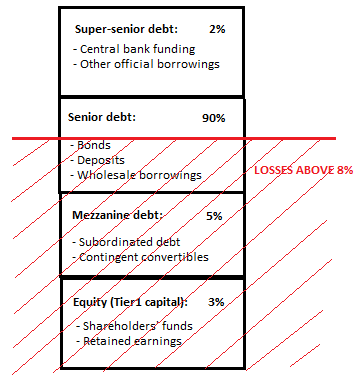 You are arguing for the capital structure of banks to contain low percentages of equity. I disagree with you on this point. 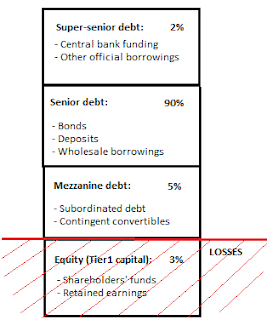 I think bank capital structure should contain much higher levels of equity so that creditors (including depositors) are better protected in the event of insolvency. I don't accept your assertion that creditors have somehow enjoyed special protections in insolvency proceedings. Creditors are often obliged to take a hit when the sale proceeds of assets are insufficient to repay them in full. But with the extremely high gearing ration you are recommending it becomes highly likely that the hit taken by creditors in insolvency proceedings would be unduly and unjustly high. Many of these creditors would be unsuspecting, unsophisticated depositors of whom, to my mind at least, the banks are taking advantage. The hit should be properly taken by the shareholders, not low grade depositors, even if those shareholders are pension funds or other special pleading groups. I don't deny depositors are creditors. But, as I say, I believe bank depositors should be treated as a special class of creditor and should be first in the queue in the event of insolvency. Professional bond investors and equity holders should be towards the back and at the back of the queue respectively. Or, separate institutions should be set up for depositors who simply want to vault their money with 100% security. Incidentally, the government backed National Savings Bank is currently closed for new business. So the choice for depositors seeking refuge from the risky commercial banking system does seem available to them. I'm going to say this once more and then close this conversation. Deposit accounts are not safe custody. The money in them is used to fund risky activities. Customers who are stupid enough not to read the small print when opening a deposit account may think they are "entrusting" their money to a bank when in fact they are lending it to them to use as they please. But they are wrong. I did check the legal position on this before I wrote this post. Deposits are an investment, not a bailment, and there is no guarantee of return of the money. That applies to both time and sight deposits, including transaction accounts. The type of deposit makes no difference whatsoever. I did not address your points regarding the legal differences between creditors and shareholders because they are not relevant in the special case of insolvency which is what I am talking about in this post. In insolvency, all that matters is the seniority of the claim. You have actually misunderstood what I said. I have not "argued for" banks to have low percentages of equity. On the contrary, I specifically said in the final paragraph that I had no problem with banks having higher percentages of equity in their capital structure. Please read what I say more carefully. I did not ANYWHERE recommend high gearing. I was changing the nature of the debate. I do not think that tinkering with the capital structure solves the underlying problem of bad management and bad lending. That is what we should be addressing - and one of the signs of better management would be a reduction in leverage. What you, or I, personally believe should be the case has nothing to do with the legal reality. If you don't like the current legal situation, campaign to change it. Simply stating that it is something else doesn't make it true. I was not aware that I had said bank deposits were safe custody. You are putting words into my mouth. What I have actually said is that depositing funds with a bank is the same as putting them in a vault. That the vault is not a very good or safe one is a separate matter and is evident from the haircut Cypriot depositors have recently endured and the bank run that almost occurred here with Northern Rock. If UK banking law was up to date then I suggest that deposit insurance would not be necessary because a modern law would re-position depositors to the front of the repayment queue in insolvency proceedings. You say in your original post that more equity in the capital structure would not make banks safer. I agree. But more equity would make the funds of depositors and other creditors safer. This for me is sufficient reason to compel banks to increase the equity component of their capital structure. A one to one ratio between debt and equity sounds about right to me (the same ratio that banks themselves use in their lending decisions to many small businesses). As an aside, I am interested in how banking analysts calculate a bank's gearing ratio. My instinct is not to include customer deposits in the debt figure, just as I would not include trade and other short term creditors in a non-bank firm's debt figure. Do you believe a bank would have too much equity if it was equal to its total liabilities? "A vault is a facility where people can place items for safe keeping." I don't think it is unreasonable of me to interpret that as meaning safe custody (custodian services). You are incorrect to claim that putting funds in a bank is the same as putting them in a vault. It is not remotely similar. Banks do not put customers' money in vaults, whether real or electronic. They use it to fund other activities. 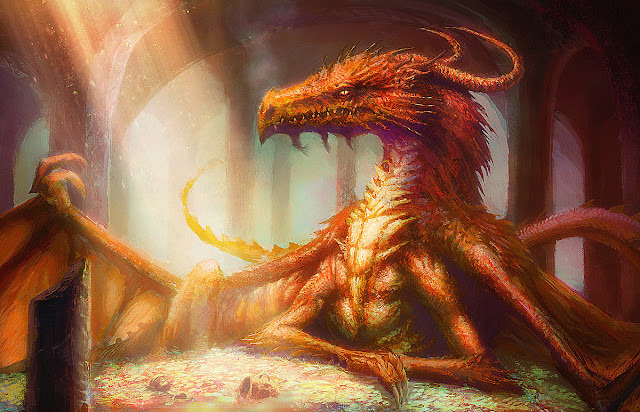 Fractional reserve banks simply do not have available at any one time all the money that has been deposited with them, because they use the money to fund lending and other revenue-generating activities. There is nothing anachronistic about this - it is how fractional reserve banking works the world over. Vaulting, as you describe it, would be full reserve banking. We don't have that. The Northern Rock bank run didn't "nearly" happen. It actually happened. It was the first retail bank run in the UK for 140 years. No banking law in the world at the moment puts depositors at the front of the repayment queue, although as I said in the post there is proposed legislation in both the Eurozone and the UK to give depositors preference. The bank's debt/equity ratio includes customer deposits, since they are loans to the bank. If they were money deposited for safe keeping (custodian services) they would be off the bank's own balance sheet and therefore would not feature in the debt/equity ratio. However, that would require a change in the legal status of customer deposits, as I have already now said several times. I am not prepared to give a figure as to a sensible amount of equity. It depends on the nature of the assets - a matter which I notice you ignore completely. You are using the word vault to describe a transaction where ownership of the asset does not pass to the custodian and instead is retained by the depositor. That's fine. I am using the word vault to describe a transaction where ownership of the asset passes to the custodian but where an obligation to repay is simultaneously created. In this case, a debtor-creditor relationship is formed. In both cases, the intention of the depositor may have been (and usually is) to protect the asset from the hazards of fire, theft, flood and what have you. It is unlikely that wages paid monthly into a bank are the outcome of an employee's investment decision. Vaulting seems an accurate description of both transactions, given the motivations of the depositors. So one can describe vaulting in legal terms or one can look at the intention of the parties. Clearly, I have used the latter. Withe regard to gearing, if a customer pays a deposit in advance for, say, a bed from a furniture retailer then that deposit will be recorded as a current liability in the retailer's books. Usually, analysts will not include current liabilities in the debt figure used to work out the gearing ratio. Gearing usually includes only long term liabilities for non-bank commercial firms. You seem to be saying that banking analysts include current liabilities in a bank's gearing ratio. I can see that doing this may produce higher gearing ratios in the banking sector compared to other sectors. Perhaps, given my concern for ordinary bank depositors, gearing ratios calculated this way are to be welcomed as it may prompt regulators to require bank capital structures to contain increased levels of equity funding. A result, as far as I am concerned. Ok, I can see where you're coming from now. I think your use of the term "vaulting" is misleading because it gives the impression - unfortunately believed by all too many gullible people - that banks store their money. However, I don't think even your definition of "vaulting" really stands up, because banks don't have any more obligation to pay depositors than they do to pay other senior creditors. Deposit insurance provides for small depositors to be reimbursed, but it doesn't create any greater obligation on the bank itself. This may change, of course. But you should be aware that the direction of EU thinking is that large depositors will be bailed in if losses are high enough - which means that large deposits are effectively subordinated debt, as I have noted in my post on Cyprus and the financing of banks. And depositor preference is by no means a done deal. The banking sector doesn't really use ordinary gearing ratios, if by that you mean the debt/equity ratio. The capital ratio is Tier1 capital/risk weighted assets. Leverage ratio is Tier1 capital/all assets. SO, really, the only way to have the bank vault my money would be to rent a deposit box and keep it in cash? What happens to the retail banking industry when this gets out? 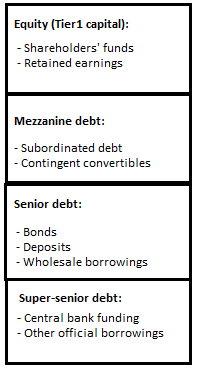 Any discussion of debt vs. equity in the case of insolvency falls into the category of ‘repair’. I think the discussion should principally focus on ‘prevention’, be that the quality of lending or the level of equity. The way I understood Admati & Hellwig is that their whole book rests on the premise that the cost to society of prevention is infinitely lower than the cost of repair (because the likelihood that repairs become necessary is reduced; not eliminated, but reduced). Yes, if banks never made bad loans and never had trading losses, they would not need equity (or not much of it). But one has to test the reasonableness of this premise. I remember, when reading “When Genius Failed”, how surprised outsiders were that, towards the end, LTCM had worked with a leverage of 40:1. Well, Deutsche Bank today works with a leverage of 40:1. Nobody worries about that because, after all, no financial institution ‘is safer when it has more equity’? When I first read Admati & Hellwig’s argument that banks should have equity of 20-30% of assets, I thought they were from the moon. Having thought about since then and reviewed their arguments over and over again, I have not come up with one single reasonable counterargument. I would like to see a formal response from the Basel-Commission to that proposal. I do think that debt/equity-swaps are useful instruments during the repair phase but it would seem more important to reduce the likelihood of a repair phase. I am not sure that one can talk about a bank’s insolvency the same way as a company’s insolvency because a bank has just so many more creditors. When a company approaches crisis stage, it can probably get all of its creditors into a conference room or hall and strike a restructuring deal with them. For a bank, one would need a football stadium (or more). Also, there may be a few multinationals which are as inertwined as large banks are, but probably not too many. During my training at the Continental Bank of Chicago in the early 1970s, I often heard the phrase mentioned to us by senior people who taught us banking: “When you are leveraged 25:1 (which CINB was), you can’t afford to make too many mistakes”. Ten years later, CINB made one too many mistakes and went bust. Yes, the problem had started with poor lending decisions but those mistakes might have been absorbed if there had been more equity. Equity may also be ‘people’s savings’ but there is a bit of a difference with deposits. Depositors deal with their own money and they are entitled to be dumb. That’s why they are protected through limited deposit insurance in many countries. Professional investors are paid to be smart and responsible when dealing with other people’s money. And, by the way, the more equity there is in a bank, the more equity holders will have an interest that bank management acts responsibly on the lending side and elsewhere in order to not unnecessarily put their equity at undue risk. Berkshire Hathaway is, in Warren Buffett’s own words, a financial concern and it has high (costly) equity. Buffett has never paid a dividend and yet, his stock has been rising for decades. Anything to be learned from that? I am not arguing for high leverage, actually. I said in the post that I didn't have a problem with there being more equity in a bank's capital structure. The points I am making are these. 1) Increased capital does not prevent bank failure. Losses are the same however the bank is financed. 2) The presupposition that equity is "loss-absorbing money" is simplistic. 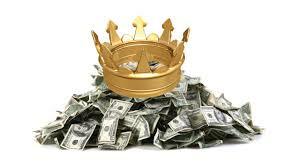 No money can absorb losses without cost, and ultimately, the cost of loss is always borne by ordinary people one way or another. Shareholders are mostly ordinary people, either directly (particularly staff, and the families of former staff) or via their pension funds. The idea that having more capital protects people's savings is simply wrong. Writing down large amounts of capital suddenly - or expropriating it - is as damaging to ordinary people's savings as writing down large amounts of debt. And it can be systemically damaging too - have you thought about the effect on banks of a run on equity (widespread dumping of shares leading to catastrophic price falls)? 3) Nor does more capital itself make banks more stable. Stability comes from good management. A badly-run bank is unstable however it is financed, and having more capital does not enforce good management. I doubt if equity holders can exercise much control over bank management, really - there is a serious principal-agent problem. 4) "Professional investors are paid to be smart and responsible when dealing with other people's money". This whole discussion is based on the supposition that banks will NOT be responsible with other people's money. That's what needs to change. You cite Buffett....his stock rises not because there is lots of equity but because his company is well managed and investors trust it. This is why I think Admati & Hellwig are wrong. Not because having more capital is a bad idea - it isn't. But because fundamentally the issue is BAD LENDING AND BAD MANAGEMENT. That's what we should be addressing, not tinkering with capital structure. I would venture to suggest that a well-managed financial company would not adopt a highly leveraged business model anyway. Address the problem of bad management and the capital problem will fix itself. You may not have noticed that I didn't express disagreement with your points. I just shifted to a different focus, namely prevention over repair. Improving lending and management is part of prevention. Limiting leverage is also part of prevention because it reduces (never eliminates it) the amount of damage poor lending and poor management can make. Of course there is always damage when there is a failure and someone has to carry the cost thereof. I totally agree that poor lending and poor management is always the spark which ignites banks' problems. But a lightening can also hit a well-managed bank and whenever a lightening hits, a place that has more protection is safer than a place which has too little. To improve the quality of lending and management is a noble goal, but how do you do that? When Joseph Ackermann drove up Deutsche's ROE-targets and when the numbers showed that profitability increased through his strategies, I don't know how one could have 'forced' Deutsche's management to be less aggressive and to gamble less. The numbers showed him as a hero for quite some time. No one ever has the nerve to oust a perceived hero and when it turns out that the hero was a joke, it is most frequently too late. Again, no real disagreement with your points except that I think most of them (other than the one on improving lending and management) relate to repair and not to prevention. I was indeed talking about repair - hence the emphasis on insolvency. However, I don't accept that increasing the proportion of capital prevents failure. Losses are losses, however the bank is financed. Sufficient losses and the bank will go down even if it is entirely equity funded. And shareholders can of course pull their funds from publicly-traded companies. What would happen if shareholders dumped shares en masse, causing share price collapse? This is, of course, what would happen if there were signs of imminent failure. It's still a bank run, just equity instead of debt. I would argue that in a well-managed bank leverage would not be excessive anyway. We should be focusing our attention on improving management standards and using things like asset portfolio balance and capital structure as indicators of the standard of management, not as an end in themselves. I think the idea that having more equity would encourage more prudent management is flawed. Shareholders want profits - they want RoE. Arguably, therefore, the more equity there is in the capital structure, the greater the likelihood that bank management will take excessive risks in order to generate the returns that shareholders expect. And shareholders have no more means than bondholders of determining whether management is taking excessive risks. Increasing capital could therefore actually make banks LESS safe. Frankly, I don't understand why you keep stressing the point that 'increasing equity does not prevent failure' when no one - to my understanding - is arguing that. Of course, nothing can prevent failure, not even the highest amount of equity. Have you actually read Admati/Hellwig's book? Where exactly do you disagree with them? (they don't argue that higher equity prevents failure!). I totally agree with you that if there were perfect managements taking only perfectly sound risks and no more, there wouldn’t be all that much need for equity. But please indicate to me action steps how to get there. There are no universally applicable action steps to assure perfect management. I guess the only thing that might work would be for boards to commission regular culture/climate surveys to get a feel for the prevailing value structure of an institution. No controls can protect an institution if the value structure, from top down, is out of whack. And I wonder how a CEO would react if his board commissioned such surveys. The action steps for improving prevention via more equity would be universally applicable and they are all in the book. Incidentally, I asked an old friend of mine who is now a member of the ECBs Governing Council whether he had read the book. He tweeted back: "The best book I have read in a long time!" I have heard sufficient people claim that higher capital requirements would prevent bank failure to feel that this needs debunking. I am not suggesting that Admati & Hellwig have said that. This post is not a critique of their book and it is unfortunate that you seem to want to regard it as one. I specifically said that the debate about whether or not banks should have a greater proportion of equity in their capital structure missed the point. It confuses cause and effect. If you improve management standards, leverage will reduce naturally, because running at very high gearing is poor management practice in a systemically-important institution. But forcing leverage to reduce through capital requirements doesn't necessarily encourage better management. Therefore to my mind the focus should be on management and lending standards, not on capital structure. I agree that this is not easy, but there are no easy answers to this problem. I am extremely wary of panaceas. A year ago everyone was arguing for structural separation of retail & investment banking as the "cure all" solution. Then the Parliamentary Commission produced their report into the HBOS failure, which clearly showed that the failures were in retail banking and structural separation would have made no difference - as I had been saying for two years before that. Now everyone wants to believe that if only banks have enough capital everything will be fine. I don't buy this one either. As far as I am concerned it is all a distraction from the boring, unglamorous and frustrating job of improving the way banks are run. 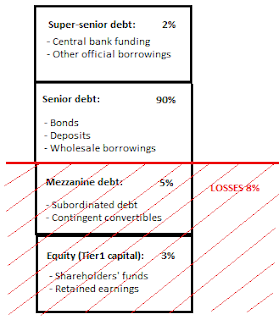 On debt/equity equivalence in insolvency - which was the core subject of this post - the Cyprus precedent in effect makes uninsured deposits subordinated debt, which is of course Tier 2 capital. I pointed this out in my post on Cyprus and the financing of banks. "What would happen if shareholders dumped shares en masse, causing share price collapse?" That wouldn't affect the running of the bank as such. Secondary market price of equity shares is technically irrelevant to a business unless it is in the market for issuing more shares. Of course share price falls in listed companies generally mean company managers have to answer irate calls from shareholders. But that's about it. The main issue I have with larger equity buffers is shareholder fragmentation. The shareholders couldn't control the banks with a relatively small number of shareholders and tight equity holdings representing huge chunks of the business. How much worse is that going to be when there are even more shareholders holding less of a percentage of the business? How well controlled were building societies by their fragmented membership? Similarly with the co-operatives. It's the agency problem on a grand scale. The tightest control is when one entity funds the bank. Hence the proposals for complete central bank funding of banks. Not so, Neil. Secondary market price is immensely important. Can I remind you about "fair value" accounting - otherwise known as marking to market? I agree with you about control fragmentation. Mark to market is for assets and investments in third parties and liabilities to third parties, not the equity in the business - which always a remainder. The amount in shareholders funds generally bears little relation to the stock market price. If the stock market price of the shares drops below the fair value of the assets less the fair value of the liabilities then you have a bargain not a bust. Umm, not sure that's true. Banks mark to market their own issued securities and take the difference to profit & loss. I agree that a share price collapse would create a fair value profit. But it would be likely to increase funding costs massively, or even cause a funding freeze - it was that I was thinking of, rather than a direct effect. Yes, spot on about shareholder fragmentation. But even so, creditors need protecting and the best way to do this, it seems, is to have a sufficiently large equity buffer to absorb losses. There are modifications to corporate governance arrangements that may address shareholder fragmentation. I refer to co-determination where shareholders elect one-half of the board and employees elect the other half from their own ranks. This would, I suggest, reduce the impact of information assymetry and help to keep the Board in check. Thank you for sharing, well written article. "I m coming" from kleingut's blog, were we usually do have dialogue about Hellenic adjustment process. For your article i may suggest that the real question is not only the problematic for more capital or "better management" but in relation, to what. Excluding banking, is relatively small the number of companies with 5-10% equity, in a viable state. But Tier 1 and Co can be "handled", occasionally is changing month by month, an example is Dexia, were equity, practically was more than 10% always the specific period, but the bank failed and saved by French and Belgium states. There are not empirical evidence that 20-30% equity as Admati & Hellwig assesing (haven't read the book) might prevent banks from failure. Even "a good management" as simplistic as it may appear can't avoid occasionally unindentional mistakes or underestimate dangers. A "buffer zone" or a "red area" is essential to be defined in a very descriptive manner.This can happen usually with more equity prerequisites. An example, Tangible Common Equity Ratio - TCE a non GAAP financial measure is used very often lately from a growing number of banks to show off financial health. There is a great difference in Tangible Book Value Per Share! There is a standard correlation that when TCE is above a percentage the bank is less healthy? No, but the substance of tangible is realistically important in almost every kind of businesses. How for 31.12.2012 they calculated Tangible Equity if Goodwill & intangibles is n.a in a different doc ??? How can I Invest money which will give me benefits?